Transcription of the TNF gene is rapidly and transiently induced by LPS in cells of monocyte/macrophage lineage. Previous data suggested that multiple NF-κB/Rel binding sites play a role in the transcriptional response to LPS of the murine gene. However, the relevance of homologous sites in the human TNF gene remained a matter of controversy, partly because the high affinity NF-κB/Rel site located at −510 in the murine promoter is not conserved in humans. Here we used two sets of similarly designed human and mouse TNF promoter deletion constructs and overexpression of IκB in the murine macrophage cell line ANA-1 to show remarkable similarity in the pattern of the transcriptional response to LPS, further demonstrating the functional role of the distal promoter region located between −600 and −650. This region was characterized by mutagenesis of protein binding sites, including two relatively low affinity NF-κB/Rel sites, #2 and 2a. Mutation in each of the NF-κB sites resulted in 2- to 3-fold lower transcriptional activity in response to LPS. In contrast to LPS activation, the response to PMA was substantially lower in magnitude and required only the proximal promoter region. In summary, the functional topography of human and murine promoters when assayed in the same system has some marked similarities. Our observations support the notion that full LPS response of TNF gene requires both NF-κB and non-NF-κB nuclear proteins. Our data also suggest that the functional activity of a given κB site depends on the entire DNA sequence context in the promoter region. The proinflammatory cytokine TNF is produced by macrophages and cells of other lineages in response to a variety of extracellular signals, including bacterial endotoxin (see Refs. 1 and 2 for review). This response is very rapid and transient, and it includes a transcriptional component as well as posttranscriptional events (3, 4, 5). Transcriptional control occurs predominantly at the level of transcriptional initiation (reviewed in 6), but there are additional contributions from transcription processivity (7) and polyadenylation (8). NF-κB/Rel is a family of transcription factors involved in regulation of numerous immune response and cytokine genes (9). Pre-existing NF-κB components are stored in the cytoplasm as inactive complexes with inhibitory molecules called IκBs. When IκB is phosphorylated and subsequently degraded in response to an appropriate signal, NF-κB translocates into the nucleus, where it can activate transcription on interaction with binding sites on DNA. The classical NF-κB is a RelA-NF-κB1 (p65–p50) heterodimer. Other activating complexes contain RelA, cRel, and RelB, and binding of such complexes to DNA may have distinct sequence requirements (10, 11, 12, 13). 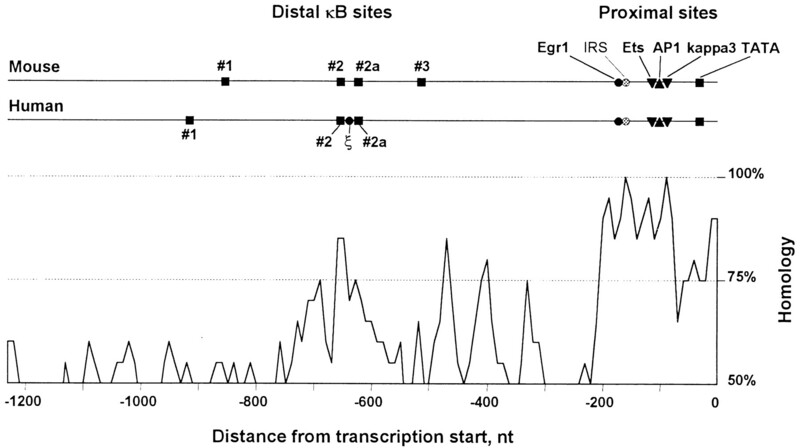 The NF-κB1 homodimer efficiently binds to many κB sequences, but this binding is associated with a negative rather than a positive effect on transcription (14, 15). NF-κB proteins can also interact with other transcription factors both on and off DNA (16, 17, 18, 19) and may become part of higher order activating complexes (20). As shown in Fig. 1⇓, a number of potential κB binding sites are present in nucleotide (nt)4 sequences of mammalian TNF genes (Refs. 21, 22, 23 and Fig. 1⇓). However, despite the general consensus on the crucial role of NF-κB proteins in the transcriptional control of the murine TNF gene in response to LPS, the specific contribution of each binding region is not fully understood. Additionally, there remains a controversy in the literature concerning the role of NF-κB in regulation of the human TNF gene, partly because the high affinity NF-κB binding site at position −510 (relative to transcription start) in the murine promoter is not conserved in the human gene. A number of studies documented the role of the proximal promoter region in the regulation of the human TNF gene. In the present study, we have made a direct comparison of murine and human TNF promoters and of sequence requirements for LPS activation using promoter/reporter constructs and transient transfections into the murine macrophage cell line ANA-1 (24), the system used in our previous work (23). We addressed the role of NF-κB in TNF transcription by overexpressing IκB (or its inactive mutant) in the same cells and studying the effects on TNF transcription. We also performed comparative binding analysis of various NF-κB sites from the regulatory regions of murine and human TNF genes. We conclude that NF-κB plays a major role in transcriptional up-regulation of the TNF gene by LPS in this macrophage cell line and that the overall sequence requirements for LPS activation of human and murine TNF genes appear very similar. Our data further support an important role for relatively weak, but highly conserved, NF-κB binding sites located between −600 nt and −650 nt relative to the transcription start. We propose that several NF-κB sites in the TNF promoter act in concert with other protein binding regions to ensure maximal activation of the TNF gene by LPS. Finally, we discuss the significance of the strong NF-κB binding by κB site #3, which highlights the difference between murine and human TNF promoters. Topography of murine and human TNF promoter regions. Bottom, Human (GenBank accession No. M16441) and mouse (GenBank accession no. Y00467) promoter sequences corresponding to full-length reporter constructs used in this study were aligned beginning with transcription start using the NALIGN program in the PC/Gene sequence analysis package (IntelliGenetics, Mountain View, CA). During alignment, several gaps were introduced into the human sequence in the −240 to −320 region (30 nt total), as well as upstream of −800. Percentage homology was calculated as a moving average using a 20-nt window with a 10-nt interval, and this function was plotted against nt position in the promoter alignment (transcription start site, right). Top, Map of NF-κB-like sites and proximal promoter elements. All sites are placed on the map according to their positions on the aligned sequences. Site ξ in the human promoter has been recently described (29). The human RelA expression construct was a gift of Craig Rosen (Human Genome Sciences, Rockville, MD). The plasmid expressing wild-type IκBα was a gift of Al Baldwin (University of North Carolina, Chapel Hill, NC). The construct expressing mutant IκBα S32,36A has been previously described (25). Two sets of chloramphenicol acetyl transferase (CAT) gene reporter constructs containing full-length mouse (−1260-CAT) or human (−1173-CAT) TNF promoters along with fragments corresponding to shorter regions of promoters have been previously described (26, 27). Mouse −1260-pGL3 luciferase gene reporter construct was generated by PCR amplification of the −1260 to +140-nt fragment of the mouse TNF promoter using −1260-CAT construct as a template and two flanking primers, KPNcat (5′-CGG TAT TTT CTC CTT ACG CAT) and BGLcat (5′-CAG GAG ATC TTG GGC CAG TGA GTG). The fragment was purified, digested with KpnI and BglII, and cloned into pGL3 basic luciferase vector (Promega, Madison, WI). Mouse promoter mutants were generated using a linker scanning technique and the following pairs of mutagenizing primers: KB1-p, 5′-GTG GGG GAG CTC GAG CCT TGG AAG, and KB1-m, 5′-CTT CCA AGG CTC GAG CTC CCC CAC (κB#1 mutation); KB2-p, 5′-GTG AGG TCC CTC GAG TCC CAG GGC, and KB2-m, 5′-GCC CTG GGA CTC GAG GGA CCT CAC (κB#2 mutation); KB2ap, 5′-ATT CCC TCT CTC GAG GCC CCA TAC, and KB2am, 5′-GTA TGG GGC CTC GAG AGA GGG AAT (κB#2a mutation); KB3-p, 5′-ACA GGG GGC CTC GAG TCC TCA ATA, and KB3-m, 5′-TAT TGA GGA CTC GAG GCC CCC TGT (κB#3 mutation); IFN responsive sequence (IRS) p, 5′-GCG ATG GAG CTC GAG CCG AGA CAG, and IRSm, 5′-CTG TCT CGG CTC GAG CTC CAT CGC (IRS mutation); KB3ap, 5′-ATG AGA TCA CTC GAG TCT CCA CCA, and KB3am, 5′-TGG TGG AGA CTC GAG TGA TCT CAT (“kappa3” mutation); and TATAp, 5′-CCC AAG GGC CTC GAG GGC GGC CGT, and KB3am, 5′-TGG TGG AGA CTC GAG TGA TCT CAT (TATA box deletion). See also Table I⇓ for sequences of mutations. Human TNF promoter constructs with point mutations at the sites κB#2, κB#2a, and “kappa3” were generated in the context of the full-length TNF promoter CAT construct (−1173-CAT) using an oligonucleotide-mediated site-directed mutagenesis method (28) with two oligonucleotides, one bearing a specific mutation and another (pSVsel) changing a unique restriction site in the plasmid for further selection of the mutant clones as follows: longmut κB#2, 5′-GCC TGC CCC AGT GGG GTC TTT GAA TTC CCG GGG GTG-3′; longmut κB#2a, 5′-GGG TGA TTT CAC TCC CCG TAG CTG TCC CAG GCT TGT CCC-3′; longmut “kappa3”, 5′-CTT CCT CCA GAT GAG CTC ATT AGT TTC TCC ACC AAG GAAG-3′; and pSVsel, 5′-ATG TAT CTT ATC ATG TCT GGT ACC CCA GGA AGC TCC TCTG-3′. All constructs were subsequently cloned into pGL3 basic luciferase vector. The construct containing a mutation at site κB#1 has been described elsewhere (29). All constructs were verified by DNA sequencing. The murine ANA-1 macrophage cell line (24) was kindly provided by Drs. George Cox (National Cancer Institute, Frederick, MD) and L. Varesio (Genoa, Italy). Cells were grown at cell density below 1 million per 1 ml in DMEM supplemented with 10% FBS and antibiotics, and transfections were performed using the DEAE-dextran protocol (21). Some transfections were done using Fugene6 reagent (Boehringer Mannheim, Indianapolis, IN). After transfection, cells were incubated in complete medium for 12–24 h before LPS (200–1000 ng/ml) or PMA (100 ng/ml) activation and for a further 6–12 h before harvesting. Cells were harvested and washed with PBS, and total cell lysates were prepared using either three cycles of freezing and thawing or resuspension in Passive Lysis Buffer (Promega). CAT assays were performed as described previously (21). Results of TLC were quantified on a PhosphorImager (Molecular Dynamics, Sunnyvale, CA), and the ratio of acetylated to nonacetylated forms was determined and used as a measure of CAT activity. Luciferase activity was measured using the Luciferase Assay System (Promega). The following pairs of complementary oligonucleotides with 4-nt overhangs were used to generate double-stranded DNA probes for murine κB sites: tp02a, 5′-CAT GTG AGG TCC GTG AAT TCC CAG GGCT, and tp02b, 5′-CAT GAG CCC TGG GAA TTC ACG GAC CTCA (site κB#2); tp04a, 5′-CAT GCC CTC TGG GGC TGC CCC ATA CTCA, and tp04b, 5′-CAT GTG AGT ATG GGG CAG CCC CAG AGGG (site κB#2a); tp05a, 5′-CAT GAA ACA GGG GGC TTT CCC TCC TCAA, and tp05b, 5′-CAT GTT GAG GAG GGA AAG CCC CCT GTTT (site κB#3); tp13a, 5′-CAT GGG GGC ATG GGA ATT TCC CAC TCTG, and tp13b, 5′-CAT GCA GAG TGG GAA ATT CCC ATG CCCC (site κB#4); and tp15a, 5′-CAT GCA ACA GAG GGG ACT TTC CGA GAGG, and tp15b, 5′-CAT GCC TCT CGG AAA GTC CCC TCT GTTG (site Ig). The following pairs were used for human κB sites: κB#1 (forward), 5′-AGC TGA GTA TGG GGA CCC CCC CTT AA, and κB1 (reverse), 5′-AGC TTT AAG GGG GGG TCC CCA TAC TC; κB#2 (forward), 5′-AGC TGG GTC TGT GAA TTC CCG GGG GT, and κB2 (reverse), 5′-AGC TAC CCC CGG GAA TTC ACA GAC CC; κB2#a (forward), 5′-AGC TTC CCC GGG GCT GTC CCA GGC TT, and κB#2a (reverse), 5′-AGC TAA GCC TGG GAC AGC CCC GGG GA); and “kappa3” (forward), 5′-AGC TGC TCA TGG GTT TCT CCA CCA AG, and “kappa3” (reverse), 5′-AGC TCT TGG TGG AGA AAC CCA TGA GC. Complementary pairs of oligonucleotides were annealed, labeled by Klenow polymerase in a 1.5-fold molar excess of either [α-32P]dATP or [α-32P]dCTP, and purified by gel filtration. Nuclear extracts were prepared as previously described (30). Extracts from activated cells were prepared 1 h after addition of either LPS or PMA. For the binding assay, labeled probe (5 × 103 to 5 × 104 cpm) and the nuclear extract (2 μl, equivalent of about 2 × 105 cells) were incubated at room temperature in 8-μl reactions for 5–10 min in the presence of 0.5 μg of poly(dI)/poly(dC), 0.2 μg of sonicated double-stranded salmon sperm DNA, and 0.25 μl of FBS in the following buffer: 10 mM HEPES (pH 7.8), 75 mM KCl, 1 mM EDTA, 1 mM EGTA, and 6% glycerol. For supershift analysis, Abs were added 5 min before the addition of the probe, and mixtures were incubated for 5 more min at room temperature. Abs 1263 (anti-NF-κB1), 1226 (anti-RelA), and 1266 (anti-cRel) have been described (31, 32). After incubation, 5 μl of binding reaction was quickly loaded on running 5% polyacrylamide gel (acrylamide:bisacrylamide, 30:1) in 0.5% TBE, and DNA-protein complexes were separated by electrophoresis at 10 V/cm for 2–3 h with extensive buffer recirculation. Gels were prepared at least 1 day before the experiment and prerun for 3–4 h before the binding reactions were loaded. After electrophoresis, gels were dried and exposed overnight to phosphor storage screens. Images were obtained using a PhosphorImager (Molecular Dynamics). Alignment of human and murine TNF promoter sequences reveals several regions of extended homology in the putative regulatory regions (Fig. 1⇑). The most noticeable conservation occurs within the first 200 nt of the promoter. This region contains several previously characterized regulatory elements, Egr-1 (33), Ets (34), AP-1/ATF/CRE (34, 35), and site “kappa3”, which is distantly homologous to κB consensus (35, 36, 37). The second region of extended homology spans ∼50 nt in the promoter between −600 and −650 nt. It contains at least two κB-like binding motifs (here called κB#2 and κB#2a). No significant homology can be observed farther upstream of this region, although one κB-like motif (here called κB#1) is present in each of the genes in nonconserved positions. An additional consensus κB site, GGGGCTTTCCC (site κB#3), is located at −510 nt in the murine TNF promoter and has no homologous match in the human sequence. As reported earlier (7), LPS (at concentration range 10 ng/ml to 1 μg/ml) has a marked effect on TNF mRNA level in ANA-1 cells (up to 20-fold induction) and on secretion of bioactive TNF (up to 5–10 ng/ml, at least a 50-fold induction). Both murine and human full-length promoter constructs (−1260 for murine and −1173 for human TNF promoters, linked to either CAT or luciferase reporter gene) responded to LPS when these constructs were transiently expressed in ANA-1 cells (Fig. 2⇓). Effects of LPS, RelA, and IκBα on the full-length mouse and human TNF promoters. ANA-1 cells (107) were transfected with 3 μg of mouse TNF construct plus 1 μg of the indicated expression vectors. For human TNF promoter, 2 × 106 ANA-1 cells were transfected with 0.5 μg of human TNF promoter/luciferase construct plus 0.5 μg of the indicated expression vectors. Luciferase activity observed for every combination of transfected plasmid is presented as a percentage of the LPS-activated signal generated with corresponding TNF promoter construct cotransfected with empty vector. A representative result of three independent experiments is shown. We then used IκBα, a highly specific inhibitor of NF-κB, to show directly that NF-κB translocated into the nucleus is required for most of the LPS-induced TNF promoter activity. When a construct encoding IκBα was coexpressed with reporter constructs in ANA-1 cells, LPS-inducible luciferase activity of either mouse or human TNF reporter construct was significantly decreased (to 30–40% of the original level). Coexpression of a degradation-deficient IκBα mutant (IκB S32/36A) resulted in an even stronger reduction (to 15–20% of the original level) (Fig. 2⇑). The specificity of the IκBα effect was further confirmed by coexpression of a construct encoding RelA (p65) and the murine TNF luciferase reporter construct. Overexpression of RelA resulted in strong up-regulation of the TNF promoter, which could be blocked by both wild-type and nondegradable IκBα. LPS activation was able to partially reverse the effect by wild-type IκB, but not of the nondegradable IκB mutant (Fig. 2⇑). We conclude that LPS-activated TNF transcription in ANA-1 cells is NF-κB dependent and that full-length human and murine TNF promoters respond similarly to LPS. To determine which regions of the promoters are required for maximal induction of the transcription by LPS, we generated two sets of constructs in which shorter variants of the full-length murine and human TNF gene promoters were placed in front of CAT reporter gene. These constructs (for murine promoter, −1260, −665, −510, −440, and −110, and for human promoter, −1173, −653, −442, −284, and −109) were transiently expressed in ANA-1 cells. 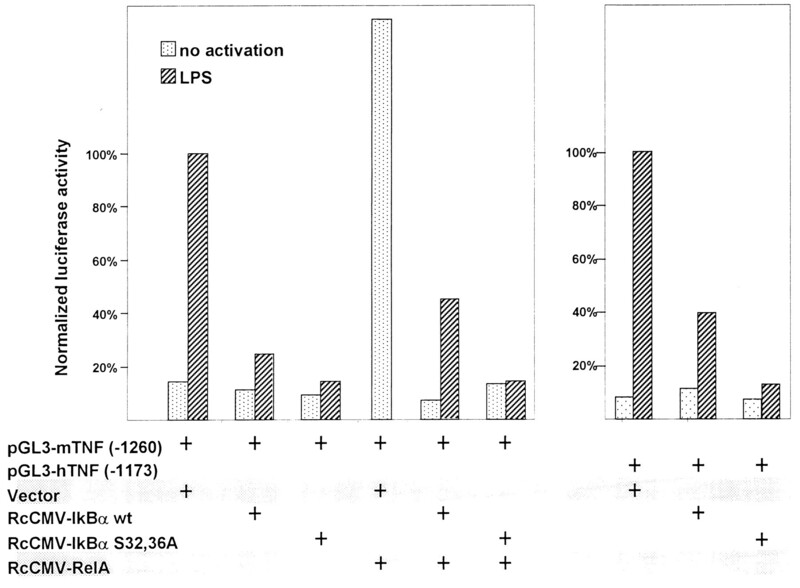 We found that the two promoters gave very similar patterns of response to LPS (Fig. 3⇓). In both cases, deletion to −665 (mouse) or −653 (human) resulted in a modest decline of responsiveness to LPS as compared with full-length promoter constructs (1.2- to 2-fold), suggesting that κB site #1 may play a minor role in each promoter. In contrast, deletion to −510 (mouse) or −442 (human) resulted in a major further drop in responsiveness (7- to 12-fold), consistent with an important role of the distal promoter region containing κB sites #2 and/or #2a. Further deletion to −440 (mouse) or −284 (human) had little effect, indicating, perhaps surprisingly, that the strong κB binding site #3 at −510 in the murine promoter makes minimal contribution in this assay. As expected, deleting most of the promoter region (to −110 in mouse and −109 in human) resulted in a sharp drop in the residual promoter activity to nearly background levels. Thus, LPS responsiveness of the murine TNF promoter is governed primarily by two regions: 1) the proximal promoter region and 2) the distal region between −665 and −510 in the murine promoter or −653 and −442 in the human promoter. This result suggests that the effects of NF-κB in LPS-induced transcription of the TNF promoter are mediated primarily by κB sites #2 and/or #2a. LPS response patterns of 5′ deletion constructs originating from murine or human TNF promoter regions. Numbers in the middle show positions of 5′ end of each promoter deletion relative to TNF transcription start. A representative result of three independent experiments is shown. To determine whether other agents that induce TNF transcription act through the same promoter regions, the deletion constructs were tested in conjunction with PMA rather than LPS treatment (Fig. 3⇑). For the full-length promoter, PMA induced much lower reporter activity than did LPS. Furthermore, unlike LPS-induced activity, the PMA-induced activity depended solely on the proximal promoter region and was not measurably enhanced by the presence of the upstream sequences. This is consistent with the observation that PMA is at best a weak inducer of NF-κB in ANA-1 cells (Ref. 26 and data not shown). To determine which specific DNA-protein complexes can be formed at the κB sites within the murine and human promoters in macrophages, oligonucleotide duplexes spanning these elements (Table I⇑) were tested in EMSA with nuclear extracts from unstimulated or LPS-stimulated ANA-1 cells. LPS stimulation resulted in formation of NF-κB/Rel-specific complexes at sites κB#1, κB#2, κB#2a, and κB#3, although they differ considerably in both affinity and pattern of bound complexes (Fig. 4⇓). The strongest binding was observed at the human site κB1 and at the murine site κB#3, while the binding at the sites κB#2 and κB#2a was relatively weak (Fig. 4⇓, A and B). Previously characterized conserved site #4 from the downstream enhancer (23) was used as a control and showed high affinity binding of slowly migrating complexes, consisting of RelA and c-Rel (23). 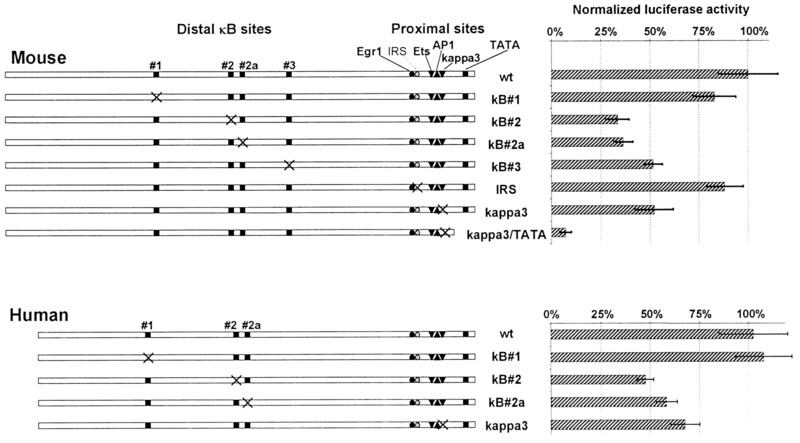 The murine site κB#1 was of a very low affinity (data not shown), and the human site “kappa3” (initially defined in 38) from the proximal promoter region failed to show any appreciable NF-κB-specific binding (Fig. 4⇓B). 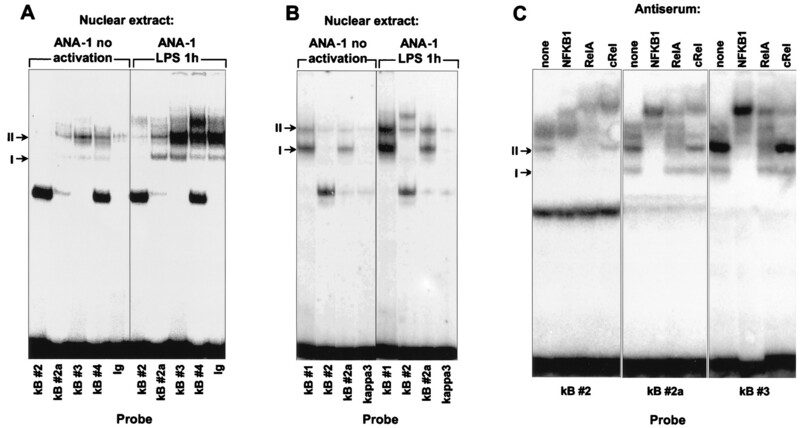 NF-κB binding by oligonucleotide probes corresponding to distal NF-κB sites from murine TNF promoter in nuclear extracts from LPS-activated ANA-1 cells. I signifies NF-κB1 homodimer, and II signifies NF-κB1-RelA heterodimer. A, LPS induction of NF-κB complexes in ANA-1 cells (mouse oligonucleotide probes). B, LPS induction of NF-κB complexes in ANA-1 cells (human oligonucleotide probes). C, Composition of nuclear NF-κB complexes from LPS-activated ANA-1 cells formed on mouse κB sites. Left and middle panels (probes κB#2 and κB#2a, respectively) are overexposed (approximately two times) as compared with other images. See Table I⇑ for the sequences of the DNA probes. NF-κB binding by the sites κB#2 and κB#2a, and by site κB#3 from the murine TNF gene promoter, was further analyzed by using NF-κB/Rel-specific Abs (Fig. 4⇑C). The analysis revealed that each site binds a unique repertoire of NF-κB/Rel complexes. Site κB#3 predominantly binds NFKB1 homodimer and RelA-NFKB1 heterodimer, while site κB#2 binds several more slowly migrating RelA/cRel-containing complexes, but virtually no NFKB1 homodimer, and a constitutive non-NF-κB complex. The pattern of protein binding by site κB#2a resembles that of site #3, with the exception of RelA-NFKB1 heterodimer, which binds to site κB#2a with much lower affinity. Similar data were obtained on κB sites #2 and #2a from human promoter (data not shown). Stimulation of the ANA-1 cells with PMA had no effect on formation of the NF-κB/Rel-specific complexes at any of the sites tested (data not shown). We conclude that the distal promoter region implicated by deletion analysis contains two well-conserved nonconsensus NF-κB binding sites (sites #2 and #2a). The region upstream of sites #2 and #2a was also implicated by deletion analysis, but a possible role for NF-κB is less clear, since there was very little binding to murine site 1 in vitro. For murine site #3 the situation was the reverse of that for site #1, namely, strong binding in vitro but little activity implied by deletion analysis. To clarify the roles of each of these sites, we turned to mutational analysis. To better evaluate the individual contributions of mouse and human κB sites to the activity of the TNF promoters, we performed mutational analysis of these sites in the context of full-length promoter constructs (see Fig. 5⇓ for the map and Table I⇑ for the sequences of the mutations). All the mutations disrupted the formation of the NF-κB/Rel-specific complexes when tested by EMSA, as above (data not shown). Several additional non-κB-related mutations of the murine TNF promoter have been included in our analysis: mutation of a potential IRS (39) and deletion of the TATA box. When these constructs were expressed in ANA-1 cells, deletion of the TATA box was the only mutation that was able to completely abrogate transcriptional activity of the promoter and its up-regulation by LPS. Mutations of some sites had minimal or no effect on promoter activity, such as mutation of murine κB site #1 (which is a weak binder), mutation of human κB site #1 (which is a strong binder), or mutation of murine IRS (a hypothetical conserved regulatory element found by computer homology search but never reported to be functional). On the contrary, mutations of all other κB sites in either the mouse or the human promoter had a substantial but partial effect on LPS inducibility (Fig. 5⇓). Among all, sites κB#2 and κB#2a appeared to have the most substantial effect on transcriptional activation. A significant effect of mutation in murine site “kappa3” is in agreement with published observations (40). The fact that site “kappa3” fails to form any NF-κB/Rel-specific or LPS-inducible complexes in ANA-1 cells (Fig. 4⇑B and data not shown) underscores the importance of interactions of NF-κB with other proteins on the TNF promoter, in agreement with the notion that NF-κB is not the only nuclear factor involved in activation of TNF transcription by LPS. We conclude that LPS activation of TNF promoter is mediated by a concerted action of transcription factor binding sites, and each of the κB sites with proven NF-κB binding is important for maximal activation. Mutational analysis of selected transcription factor binding sites in the murine and human promoters. See Table I⇑ for the sequences of mutations. For every TNF promoter/luciferase construct, the average value and the SE of LPS-activated signal derived from four independent experiments is expressed as a percentage of the wild-type signal. The average fold induction of wild-type constructs by LPS in these experiments was 12 for murine promoter and 16 for human promoter. As more research is being done toward understanding LPS signaling pathways, it is important to know that the results obtained in mice are applicable in the case of humans. Although for the murine TNF gene the role of NF-κB is well documented and generally accepted, the absence from the human TNF promoter sequence of the only consensus κB site (site #3 at −510) made the involvement of NF-κB less obvious. Furthermore, in many of the early studies of the human TNF promoter, researchers used reporter constructs containing only the proximal promoter region and were able to observe the activating effects of PMA and LPS (36, 38, 41). However, as this study shows, these activation levels were only a fraction of the maximal level that is dependent on NF-κB and on the presence of the distal promoter region. When promoter sequences of TNF genes from different mammalian species are aligned, the distal promoter region containing κB sites #2 and #2a appears as one of the most highly conserved noncoding sequences throughout the whole TNF gene (21, 22). The degree of conservation is similar to that found in the proximal promoter region and in the previously characterized downstream κB enhancer element containing κB site #4 (23). A possible reason for evolutionary conservation of a nontranscribed sequence would be its functional importance as a regulatory element. Using reporter gene assays in the mouse macrophage cell line ANA-1, we directly demonstrated a major role for NF-κB, since preventing nuclear translocation of NF-κB by overexpression of its specific inhibitor IκB can block the activation of the TNF promoter. Additionally, we used deletion and point mutants of the promoter region to interfere with NF-κB-mediated activation at the level of DNA binding. These analyses showed that in the distal promoter region at least two nonconsensus NF-κB binding sites (#2 and #2a) are essential for maximal LPS responsiveness. The combination of κB sites #2 and #2a, as well as the region between them, has recently been reported to be important for LPS-induced activation of the human TNF promoter in the human monocyte cell line MonoMac6 (29). The relative activities of single site mutants are consistent with the earlier report (40), but we extend these findings to an additional site, κB#2a, which has not been previously characterized. Our data also do not necessarily contradict studies using only the proximal promoter region and suggest that there is indeed an NF-κB-independent component to LPS activation that can be mediated through known or perhaps not yet characterized binding sites in the TNF promoter. Although mutation data clearly show that κB site #3 in the murine promoter, which has high affinity to both NF-κB1 (p50) homodimer and RelA-NF-κB1 (p65-p50) heterodimer, makes a contribution to maximal LPS inducibility, it may play a less important role than much weaker binding sites κB#2 and κB#2a (Fig. 5⇑). This suggests that even the strongly binding NF-κB element is functional only when placed in the appropriate sequence context of the promoter/enhancer region. “Sequence context” can refer to the internal context of the site κB#3, in which case one possible missing component could be HMG-I(Y) protein (42), which would not bind well to a κB site with only 3 A/T nt in the middle (Table I⇑), or it can refer to the absence of additional binding sites for other transcription factors in the vicinity of κB site #3. The latter possibility is quite likely, given the notion that NF-κB often binds within clusters of other protein-binding sites and can physically interact with several other transcription factors (16, 17, 18, 19, 43). Of interest, the region around sites κB#2 and κB#2a has been reported to attract some other nuclear proteins along with NF-κB (29). Another possible hypothesis concerning the role of κB site #3 is that it may predominantly mediate the response to NF-κB1 homodimer at the late stages of LPS activation. Such a response may be associated with an extinguishing rather than an activating effect on the promoter, as suggested by recent reports on the role of NF-κB1 homodimers in tolerance to LPS (44) and in down-regulation of TNF by a novel cytokine activity (45). Indeed, in contrast to the transient LPS-induced increase in nuclear RelA-NF-κB1, NF-κB1 homodimers accumulate at the late stages of LPS response in murine macrophage cell lines and become the predominant NF-κB complex (Refs. 23 and 45 and our unpublished data). While the manuscript was in preparation Foxwell et al. (46) reported experiments with IκB expressed from an adenoviral vector that could inhibit the induction of TNF by LPS in human monocytes by 80%, thus supporting the role of NF-κB in this process. We thank L. Drutskaya for technical assistance and A. Shakhov for helpful criticisms. We are also grateful to Drs. P. Johnson and M. Baer for reviewing the manuscript. ↵1 This project has been funded in whole or in part with Federal funds from the National Cancer Institute, National Institutes of Health, under Contract NO1-CO-56000 and by the U.S. Department of Health and Human Services under contract with Advanced BioScience Laboratories. The project was also supported by Grant 96-04-49491 from the Russian Foundation for Basic Research and through the Russia Program of the Cancer Research Institute. D.V.K. is a recipient of American Cancer Society International Fellowship for Beginning Investigators fellowship from the International Union Against Cancer. S.A.N. and R.L.T. are International Research Scholars of the Howard Hughes Medical Institute. The contents of this publication do not necessarily reflect the view or policies of the Department of Health and Human Services, nor does mention of trade names, commercial products, or organizations imply endorsement by the U.S. Government. The publisher or recipient acknowledges right of the U.S. Government to retain a nonexclusive, royalty-free license in and to any copyright covering the article. ↵2 D.V.K. and I.A.U. contributed equally to this work. ↵4 Abbreviations used in this paper: nt, nucleotide(s); CAT, chloramphenicol acetyl transferase; IRS, IFN responsive sequence; EMSA, electrophoretic mobility shift assay. Beutler, B.. 1992. Tumor Necrosis Factors: The Molecules and Their Emerging Role in Medicine Raven Press, New York. Kuprash, D. V., R. L. Turetskaya, M. P. Boldin, I. A. Udalova, E. M. Kistanova, J. B. Smirnova, S. A. Nedospasov. 1993. Structure and regulation of tumor necrosis factor genes at genomic loci. W. Fiers, Jr, and W. A. Buurman, Jr, eds. Tumor Necrosis Factor and Related Cytokines: Molecular and Cellular Biology and Clinical Relevance 19 S. Karger, Basel.